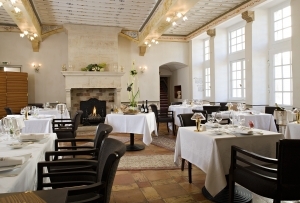 Our restaurant on the ground floor of the Château offers for hire a variety of rooms decorated in an 18th-century style ‘with a contemporary twist’. In the summer, you may dine outside in the main courtyard.A delightfully relaxing place to enjoy a cocktail, a glass of the Château’s wine and other delicacies. You will love its atmosphere. Open daily from 7pm to 9 pm, Saturday and Sunday from 12 noon to 1pm. Restaurant for non-residential guests closed at lunchtimes Monday to Friday. Seminar catering and Buffet Brunch in the Le Parc Extension available daily.